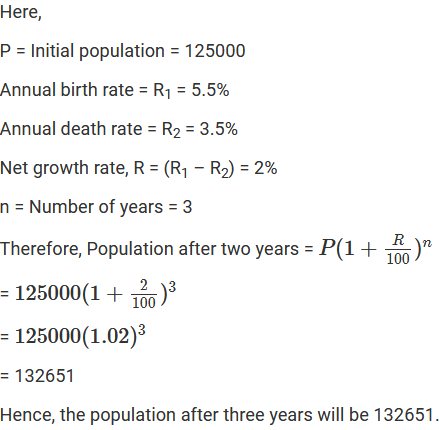 The population of a city is 126000. 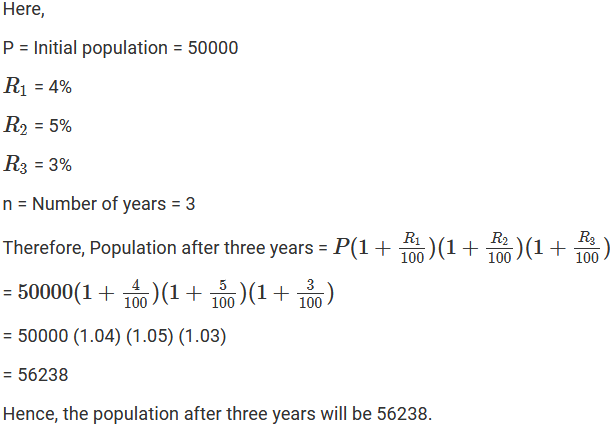 If the annual birth rate and death rate are 5.5% and 9.5% respectively, calculate the population of city after 3 years. There is a continuous growth in the population of a village at the rate of 5% per annum. 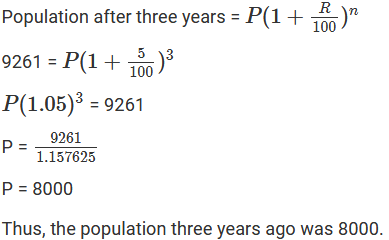 If its present population is 9261, what it was 3 years ago? 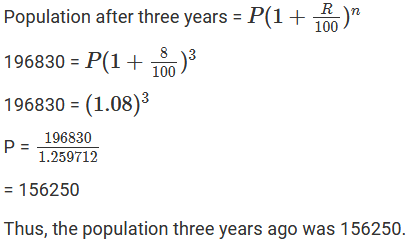 The annual rate of growth in the population of a certain city is 8%. 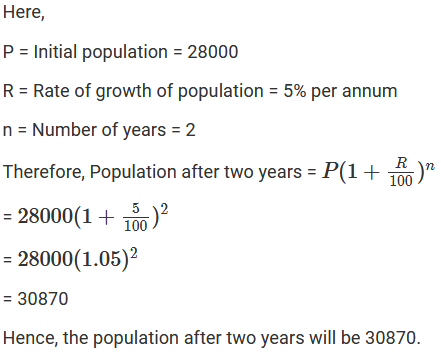 If its present population is 196830, what it was 3 years ago? 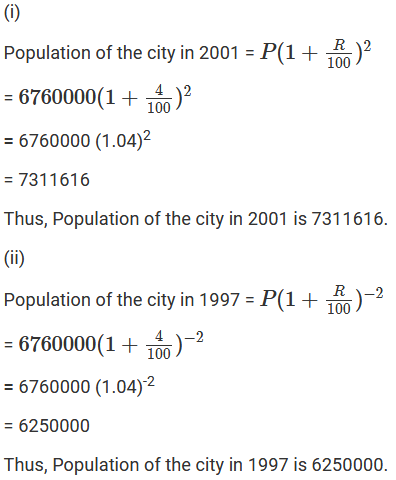 The population of a certain city was 72000 on the last day of the year 1998. During next year it increased by 7% but due to an epidemic, it decreased by 10% in the following year. 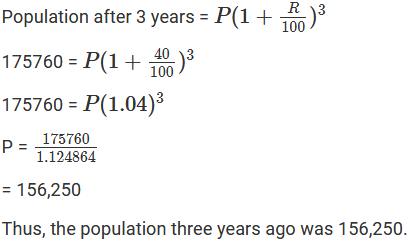 What was its population at the end of the year 2000? 6400 workers were employed to construct a river bridge in four years. At the end of the first-year, 25% workers were retrenched. At the end of the second year, 25% of those working at that time were retrenched. However, to complete the project in time, the number of workers was increased by 25% at the end of the third year. How many workers were working during the fourth year? At the end of the first year, 25% of the workers were retrenched. At the end of the second year, 25% of those working were retrenched. At the end of the third year, 25% of those working increased. Thus, the number of workers during the fourth year was 4,500. Aman started a factory with an initial investment of its 100000. 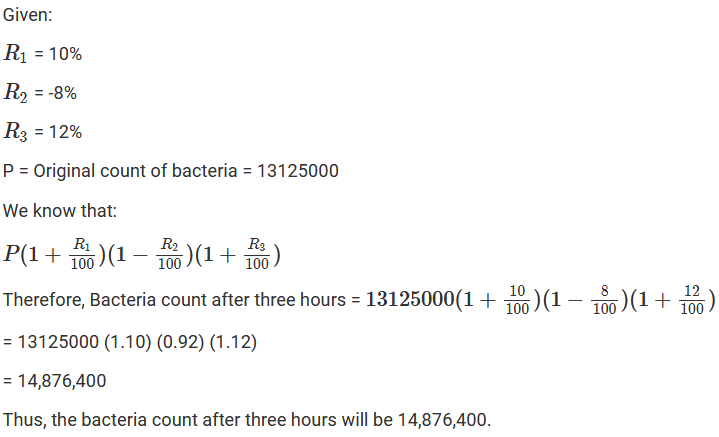 In the first year, he incurred a loss of 5%. However, during the second year, he earned a profit of 10% which is the third year rose to 12%. 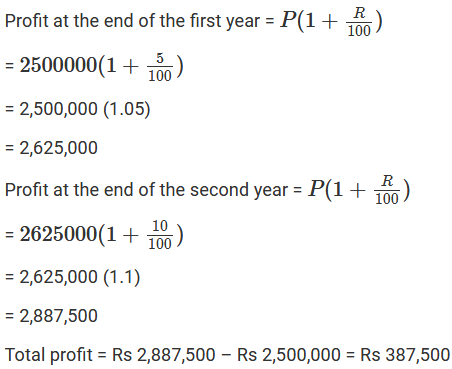 Calculate his net profit for the entire period of three years. 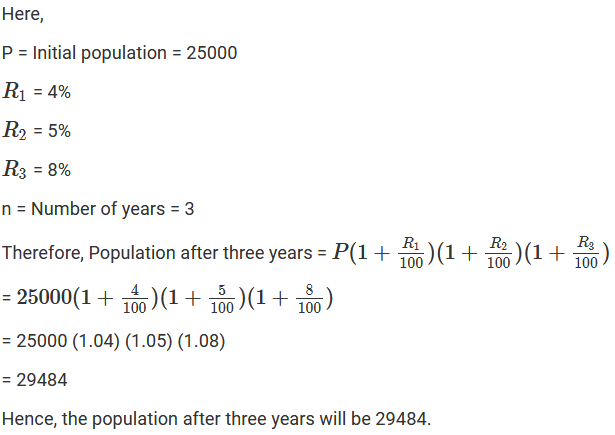 The population of a town increases at the rate of 40 per thousand annually. 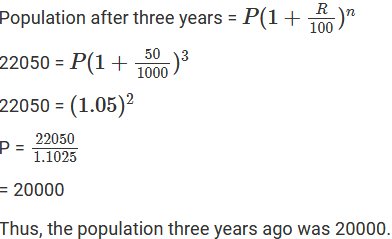 If the present population be 175760, what was the population three years ago? The production of a mixed company in 1996 was 8000 mixies. Due to increase in demand, it increases its production by 15% in the next two years and after two years its demand decreases by 5%. What will be its production after 3 years? Jitendra set up a factory by investing Rs 2500000. During the first two successive years, his profits were 5% and 10% respectively. 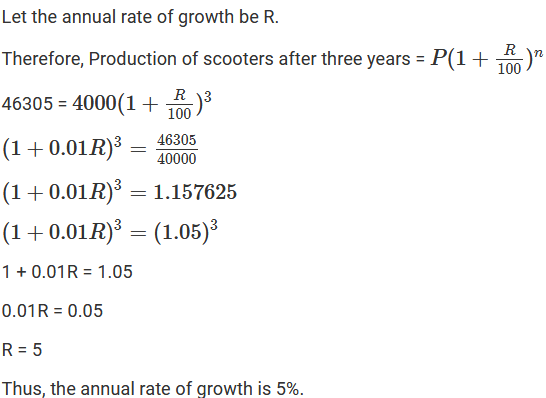 If each year the profit was on previous year’s capital, compute his total profit.